I may seem late to the party, way late in this season of The Night Shift to be finally writing about it, but…real life has a way of getting demanding of our attention in both day and night shifts, leaving little time and bandwidth to be articulate. That being the case for me personally, I still have been watching, tweeting, and reminding folks to watch…and now, it is time to elaborate on season three, as I see it. 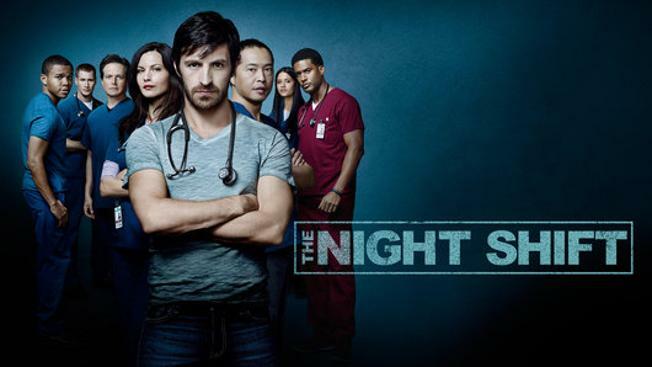 I’ve been posting here about The Night Shift since prior to season one. I got my hot little hands on the pilot episode before the premiere, and shared my thoughts on it. Of course, as luck would have it, that was an earlier version of the pilot than what aired, and character and plot lines were different. All good. Still enjoyed it, was eager in its potential, and at its core, it remained similar to what I saw and discussed. More notes on season one, and then on season two, glad for its renewal into season three…and actually for me, the biggest ‘ok let’s see what they are really made of’ anticipation was for season three. First seasons are full of the initial surge of inspiration, the fuel of cast and crew working to create something new that will hook and endear an audience. To me a well liked first season is wonderful, and has potential, but it takes a bit more to see what they all DO with the legs their show has. Season one was ace in my book and had me ready for a show that would continue on in the quality already exhibited. Second seasons, as I even wrote at that time, are like a second date, you want to deliver enough of what they liked the first time and yet be different enough to not be boring. It also strikes me a bit like sophomore year – you think you have it nailed as to how to carry through, but there IS new material and experience. Like many second seasons, The Night Shift delivered changes, and intense stories, as well as some great humor. Was any of it unexpected? Depends on who you ask. I’m a challenge on that as I usually have a good sense of the direction in which a show and characters will unfold. I enjoyed it, that is for certain. My viewing and recommending was just as much from enjoyment as it was from affection and loyalty. So for me, season three was going to be defining. That potential, that inner grit, the dark and not-so-looked-at aspect to each character’s personality, psyche, and choices… how much would we see? See, I never just look for suspenseful stories. That IS what TV is. None of us tune in to anything for what we expect. The excitement and anticipation is for where we will be taken, what we will be shown, that is unexpected. Just to get it out of the way, I will say that there is a particular snafu (in my not so humble opinion) that has reoccurred twice now, in terms of exiting characters. Not the if they go, but the HOW. Gabe… let’s chat. NOT because it’s what I personally need to see, but because it’s about the value and respect for your characters and the affection and attachment that your audience develops for them. It really does matter. So did season three deliver? I think it did. Always with an odd and maybe even unpopular perspective, here is what engaged me this season: Yes, the new characters added new experience and dimension. Yes, the episodic stories were full of action and excitement. Suspense layered upon suspense. Yes, there were the main character storylines that kept folks engaged. For me…. It was often how I didn’t agree with either person in a scenario, that held my interest. It is REAL. We can adore two people in a situation or a couple even, and not agree with, maybe even shake our head in dismay at, how they handle things. That is real. You are rooting for both of them, kind of want to sit them each down (separately) and say ‘what exactly are you thinking!?!?’. That is real. It is people. It is life. And that – for as much as we want to escape OUR reality for an hour of watching a program, we want to be able to RELATE, and for that, it takes that real life experience more than anything to reach, touch, and keep viewers. It has been wonderful seeing the roles of our favorite nurses expanding, and becoming more of who we tune in for. The main characters….It is interesting, as the cynic in me predicted about 90% of how some would grow and show us who they are. There have been some fabulous surprises, and unexpectedly amazing plots. Brendan Fehr you have really ‘brought it’ and have been a privilege to watch. Others, there is SO much more, the surface just scratched, the potential so rich… don’t stop now Night Shift… you’ve got the goods, so use it! Tonight, the season 3 finale airs, and I am sure that we will be left with heart stopping cliff hangers, as such is the way with good television. No matter what we feel we see resolved, or what leaves us wondering…. I hope that The Night Shift is renewed for season 4 and as many more seasons as the cast and crew passionately wants to bring it to us. For those who have missed the show thus far (any or all seasons) – you MUST give it try. It is more than a medical drama, not a ‘soapy’ feel at all and yet loaded with friendships and other relationships that are rich and textured and worth your time and attention. Anyone who is a few episodes behind – catch up. NBC has recent episodes free online, or you can do what I do and purchase the season on Amazon and watch (as many times as you want as you own unlimited access) all three seasons, commercial free. Sincerely hoping all three seasons (thus far) are released soon on DVD/Bluray. To the creators, cast, and crew of The Night Shift… many thanks… and here’s to many more!